We compare Travel Insurance covering Hot Air Ballooning including accident, medical emergency, repatriation, loss of earnings and personal accident policies. Travel Insurance including organised pleasure trips in hot air balloons without additional premium. Hot air ballooning one of over 90 sporting activities included as standard. Hot air ballooning is where you are transported through the air in a gondola or a wicker basket with a bag, which is commonly known as an envelope, that is able to contain heated air. The heated air is generated often from an open flame. Hot air ballooning is one of the oldest types of aviation and is often used as a romantic trip. Hot air ballooning is very popular in places such as Kenya, France and Disneyworld in Florida where the views are spectacular. 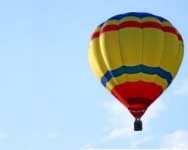 It is important to find insurance which covers hot air ballooning because, although it is seen as relatively safe, there are still some risks. As with all insurance policies it is important to ensure that all aspects of your trip are covered and not just the hot air ballooning. To ensure that your insurance policy does cover your whole trip it is important to read the terms and conditions and remember that you do have a 14 day cooling off period if you are unhappy with any policy. If the hot air ballooning is a one off experience, it may be worth considering single trip policies instead of the annual travel insurance policies. Flexicover policies include hot air ballooning insurance within their travel policy at no extra charge, but it can only be used for organised pleasure rides,if all the local laws are adhered to and if the recommended safety equipment is worn. The Post Office offer hot air ballooning cover under their normal travel insurance for no extra charge, however, it is essential to note that this is only for licensed operations and piloting is not covered by this policy. JS Travel Insurance specialises in many sports and activities including hot air ballooning within their travel insurance. Hot air ballooning can be a spectacular way to see sights and enjoy the landscape so it is well worth doing if you get the chance! It is a relatively safe activity, though there can be accidents these are generally due to poor weather. Suffering from a pre-existing medical condition doesn’t necessarily mean that you are unable to get an insurance quote as JS Travel Insurance also specialise in this area, so enquire with them to see whether you can still be covered. Many of the injuries from Hot Air Ballooning occur from bad weather blowing the balloon off course, so it is important to check the weather conditions before travelling and ensure a professional is with you at all times. The main dangers are crashing into electrical poles, landing at high speeds, landing in the sea or having a mid air collision.